Summer is ending! The growing housing market in Denver continues to increase homes price per square foot. MLS data shows an increase in the number of homes on the market which gives prospective buyers more options to consider when purchasing a home. In addition, homes are being sold at higher prices due to increasing property value in the Denver area. Summer is the perfect time to either buy or sell a home! The data below shows the health of the housing market. Fewer homes were sold in July when compared to last July. 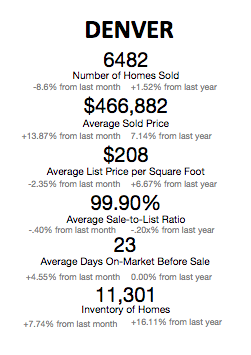 6,482 homes were sold in the Denver area this July. This is a 8.6 % decrease from last month and a 1.52% increase from last July. The average price of a home is currently $466,882 which is a 13.87% increase from last month and a 7.14% increase from last year. An increase in selling price is an indicator of growing competition and property values. Homeowners are on average receiving more money selling their homes than in previous years which is encouraging homeowners to sell. The average price per square foot in Denver is $208 and has increased 6.67% from last year and 2.35% from June. This increase in value indicates that Denver homes are becoming more valuable, encouraging homeowners to sell. In addition, homes are being sold near their original asking price. On average, homeowners are making 99.90% of their home’s original asking price. This rate has only decreased .40% from last month. Any percentage over 95% is excellent news for homeowners because it assures sellers that the value of their home will be kept throughout the selling process. Homes are staying on the market an average of 23 days before being sold. Closings are occurring 4.55% faster than June 2018. An average of 44 days is quick, and this tight market competition will continue to drive the real estate market going forward. 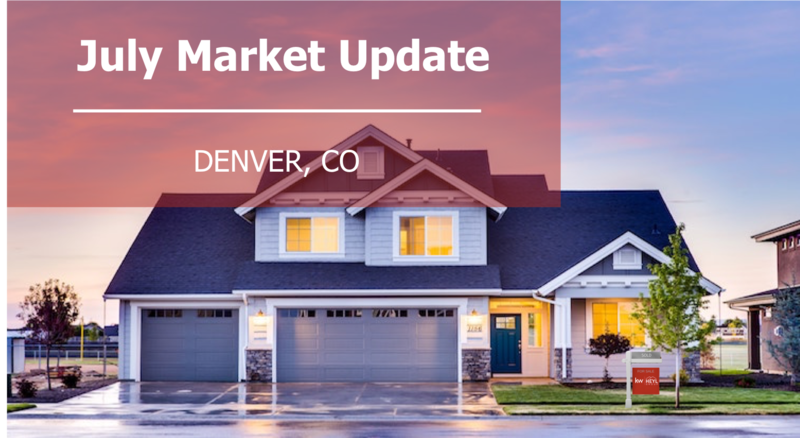 In Denver and the surrounding area, the inventory of homes has increase by 16.11% from last year while the number of homes on the market increased by 7.74% from June to July. Potential buyers should be aware of the competitive environment if they plan to purchase this fall.